Formula One is taking on a new face now that its new bosses are settled in, and it’s mostly good: the improved online presence, live streaming, the end of grid girls, a look into better racing and the like. But someone messed up badly in the design aspect—like, worse than the people who use Comic Sans professionally. Or the people who use Comic Sans at all, really. It’s been great to enjoy F1’s new online presence for the past year or so, with its best clips on YouTube and its actual inquiries into what fans want. 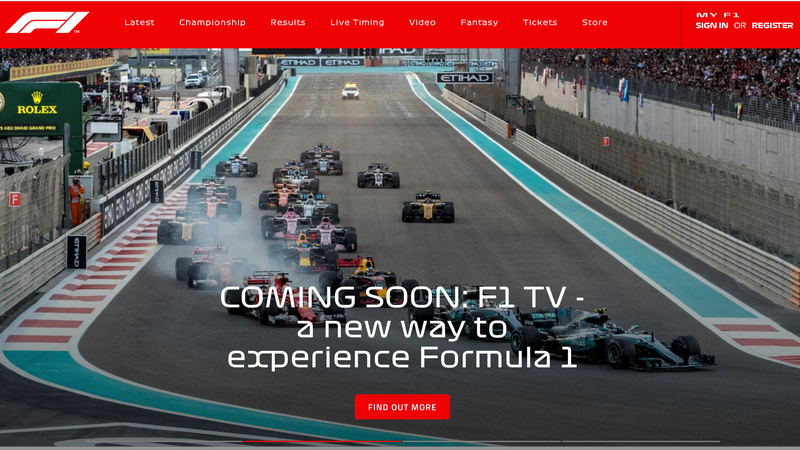 But it’s hard to enjoy that online presence now, because along with F1’s new logo that looks strangely similar to 3M’s line of compression accessories, the series changed its entire website font. It’s one of the several fonts made just for F1, according to Gizmodo U.K., which are apparently called F1 Regular, F1 Turbo and F1 Torque. Oh, you think I’m exaggerating, and maybe even “too sensitive” about this matter. That’s fine. Keep thinking that, as I show you the error of your ways. Casually want information from the F1 website on what Renault is working on? Sorry, what were we talking about? Exhaust boost? I seem to be unable to read now that the sharp angles of that lowercase “a” have transformed into daggers and stabbed my eyes out. Maybe I need to look a little closer. Yes, confirmed, this font makes me want to stare into a running exhaust pipe. Wait, that’s not what I came to the website for, is it? Alright, how about we give up on that one and try to see how those scary Honda power units are doing so far this year. Back to the F1 updates page we go. The only thing off to a flying start here is that lowercase “x,” which could actually fly off of the page at any moment. It looks like the butterflies I used to draw when I was... just old enough to pick up a crayon, whenever that was. Fine, let’s try to check in on preseason testing results. The only person who needs to be in the best shape is me, because while I can’t focus on the font long enough to read that paragraph, I’m pretty sure this is an invitation to an obnoxious space-themed party thrown by some rich, older, but not-too-design-savvy family friends who’ve known me since I was a baby and they were approximately 45. I want to look good in my shiny elastic space outfit. Perhaps there’s a theme here. The angles of the lowercase “a” definitely want to stab our eyes out, the lowercase “x” is preparing to fly away, and the whole font together looks like some kind of cheesy space message from a video game that’s popular among fifth graders. F1 obviously anticipates the end of the human race soon and is planning to blast off to Mars to save the sport’s elite. At least we all have an avenue to complain about the new society’s font while we live out our time here on Earth.